People normally visit shrines which they think are popular and important. Many times they skip places unknown to them even if they pass through them. Tour operators also plan to cover only those “important” places. The less known temples are thus left to the visits of few souls who consider all ancient shrines alike. If we take Kumbakonam – Thanjavur route for example, the often sought places are those in Kumbakonam town and Swamimalai. How many of us visit equally important Temples at Thiruvalanchuzhi and Nallur? Less said the better if we talk about those numerous temples en route which are left unnoticed. Not far away from Kumbakonam are the great Temples at Innambur and Thiruppurambiyam which can be easily covered within few hours if stationed at Kumbakonam. Sekkizhar,the great Saivaite poet describes the route taken by Sundharamurthi Nayanar from Pazhayarai to Thiruppurambiyam by mentioning the places en route. After completing the pilgrimage to “Kongu Naadu’, Sundharar returned to Chola Naadu by reaching Karkudi, a place near Thiruchirappalli and sang Thevaram Hymns on The Lord. Then he went to Pazhaiyarai, one of the capital Cities of Chola Kingdom and worshipped at Aarai Metrali, located on the western side of Pazhayarai Town, very close to Patteeswaram and Thiruchathimutram. The Temple at Aarai Metrali is on an elevated platform, not looked after so well. Then he proceeded to Innambar now known as Innamboor. The road from Patteeswaram joins Thanjavur road near Thiruvalanchuli at a distance of 3 km. The wonderful Temple at Thiuvalanchuli is about 1 km from the famous abode of Subramanya at Swamimalai. The road from Swamimalai to Kumbakonam has a diversion at a place called Puliyancheri from where one has to travel 2 km to reach Innambar and 3km thereafter to reach Thiruppurambiyam. The origin of the name Innambar is not clearly known. There are similar names that sound almost alike such as Ambar, Athambar ae there in Chola Kingdom. In this case, the prefix “ in “ distinguishes this place from Ambar which is near Poonthottam. Innambar is the 45th Temple on the northern bank of the river Cauvery. 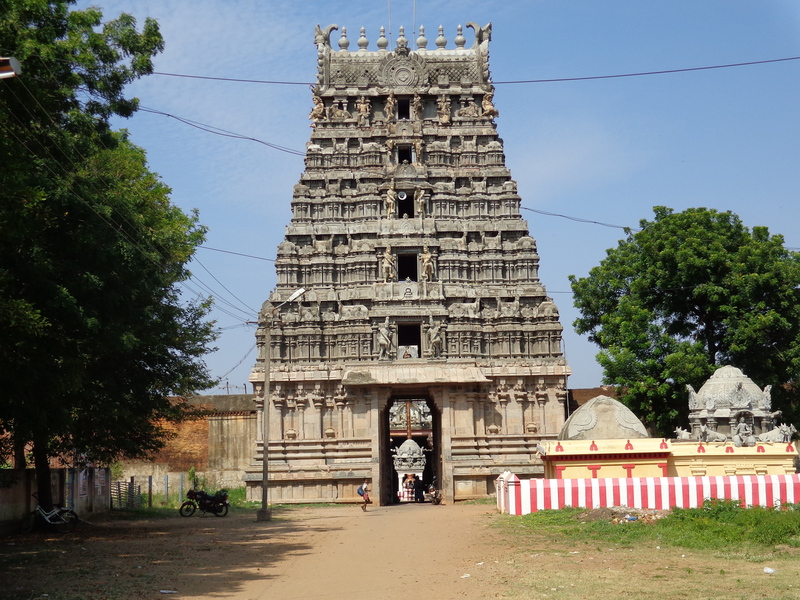 The east facing Temple has a five tier Rajagopuram at the entrance. On entering the outer prakaram, we find the shrine of the Goddess Sugantha Kunthalambikai facing south. The Temple’s garden (Nandhavanam) is also there in this prakaram. We enter the Main sannadhi by crossing the second entrance. Naattukottai Nagarathar community has renovated Swami sannathi and the inner prakaram. It presents a new look after the recent renovation and consecration. 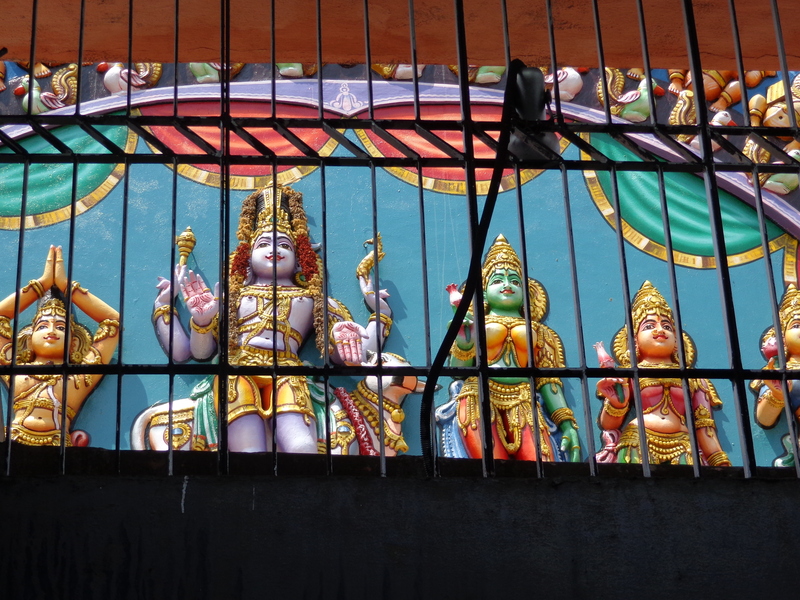 A huge Gajabrushta vimanam adores the sanctum. After crossing the Mahamandapam we get the dharshan of Swayambunathaswami from ardhamandapam. The Lord in the form of Mahalingam is huge and the avudayar is also huge in size. It is definitely an unforgettable dharshan which one should not miss. In fact we can visit this place as many times as possible in our lifetime to have a glimpse of this Murthi. Since He is worshipped by Airavatha, the white Elephant of the Devas, He is also known as Airavatheeswara. The Temple pond opposite the Temple is called Airavatha Theertham. The Lord has taught Tamil Grammar to the great sage Agasthya in this place. The legend also says that the Lord appeared in human form and submitted the accounts of the Temple to the King. Hence He is called Aksharapureeswara in Sanskrit and Ezhuththariyum Peruman in Tamil. Appar’s Thevaram Hymn says that The Lord takes down the names of those who worship Him with flowers and also those who ignore Him. Sambadhar has also sung Hymns in praise of this Lord. Thiruppurambiyam is located 3 km from Innambur and Sakshinathaswami Temple of this place is praised by all the four acharyas of Saiva sect. Incidentally, this was the battle field of the Cholas in 9th Century.It is said that Aditha I built this Temple in memory of his victory and called it as Adhitheswaram. This village is surrounded by river Manniyar on the east, Kollidam on north and Cauvery on south. Sthalapuranam mentions this place as Kalyanapuram and Punnaagavanam. There is a separate shrine fo Sri Dhakshinamuthi near the entrance. Special mention is made about this deity by Sambandhar and Manickavasagar. 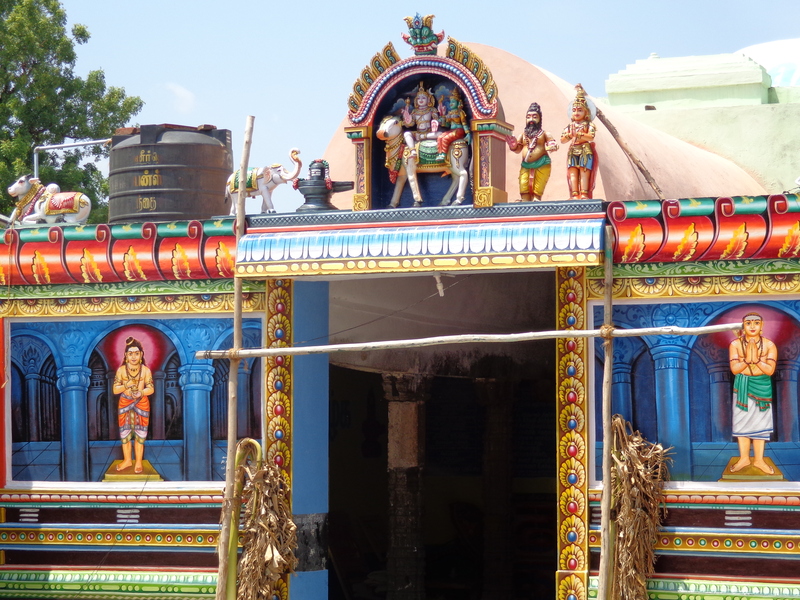 This is also one of the famous places of Lord Dhakshinamurthi. The imposing 5 tier Rajagopuram faces east and the adjacent outer prakaram has an alankara mandapam that houses Guhambika sannidhi. 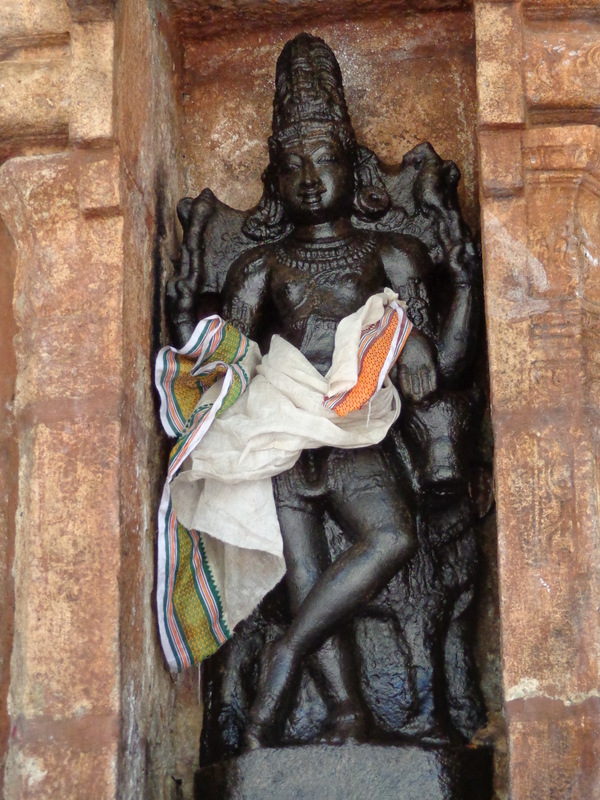 The Goddess Ikshu rasabhashani ( karumbadu sollammai) faces south in a separate shrine in the same prakaram. The second prakaram has Saivacharya sannadhi and Ganapathi, Somaskandha, Subramanya, Lingas worshipped by Agathya, Pulasthya, Sanakathi rishis and Vishvamitra on Thirumaligaipaththi. Many murthis in Deva koshtas have suffered extensive damage in the hands of anti-socials. 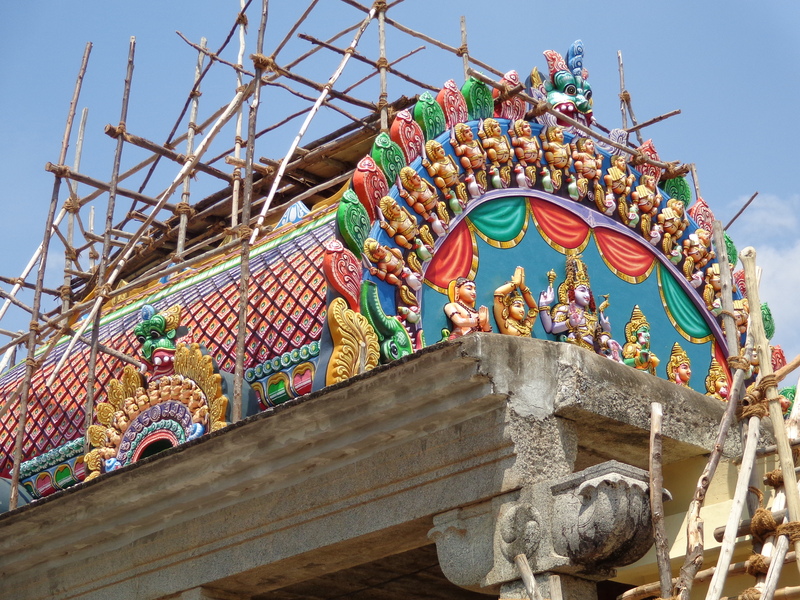 The sculpture of Kalsamharamurthi has been nearly destroyed. It calls for proper protection to all monuments. Sthala vruksham is “punnai”which is seen on the north-west side of the prakaram. On the south east of Mahamandapam of swami sannadhi is a shrine for Pralayam kaatha Ganapathi. The swayambu murthi is also worshipped by Varuna. Abishekam for this murthi is carried out only once in a year – on Vinayaka Chathurthi day. Dwarapalakas stand at the entrance of Sri Sakshinatha swami. 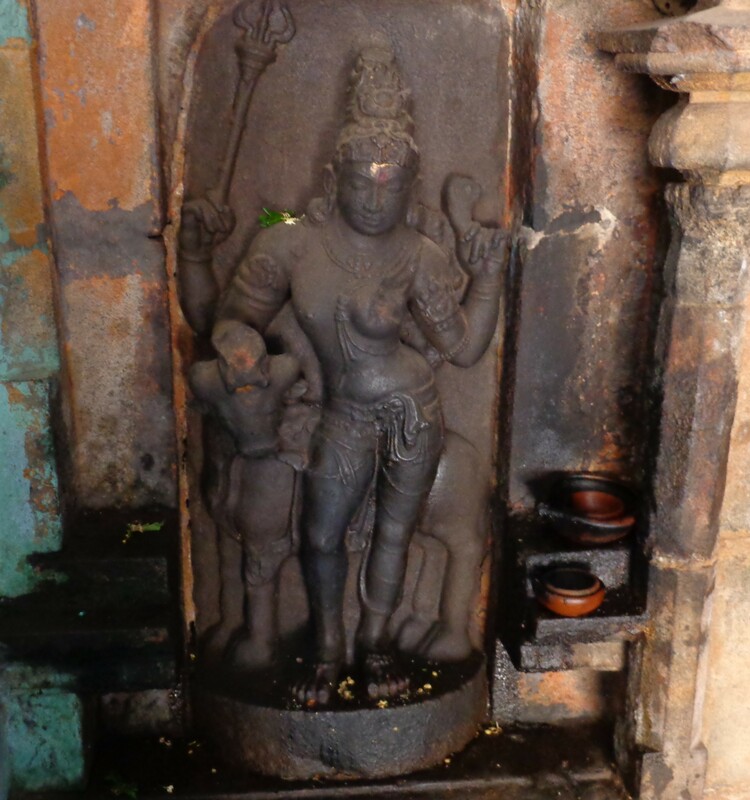 Vanni, well and Sivalinga of this place appeared in Madurai to give evidence for the marriage that took place in Thiruppurambiyam between a merchant of Madurai and a girl of Puhaar. Hence the Lord is known as Sakshinatha. As the sage Dhuvasa had cursed Haridwaja, a Magatha King became sick. He got rid of the disease when he reached Thiruppurambiyam and worshipped the Lord. Himavan,Drona,Viswamitra ,Sugeeva, to name a few, have worshipped the Lord to be blessed by Him. Inscriptions dating from the period of Rajakesai varman to Kulothunga Chola are found in this temple. Renovation work is on at this Temple in full swing. The involvement of Sivacharya of this Temple is tremendous. Knowing fully that it required huge sum to renovate the temple, he narrates the visitors about the importance of the temple and calls for their assistance. Many donors come forward to give building materials and some others involve themselves in repairing the vahanams, painting the walls and providing backup inverter. Plastering the outer wall is the only giant work remaining. With hopes pouring from all directions, the Sivacharya is optimistic to conduct the consecration ceremony at the earliest. We need people like him at all village temples so that the devotees are briefed properly and involved as well in maintaining/renovating the shrines.